Macrorit Disk Scanner is a free portable tool which scans drives drives for errors and highlights them on a graphical map. The program has two advantages over the standard Windows options (chkdsk, right-click > Properties > Tools in Explorer). The first is that you're able to choose the area to scan. We're unsure how often you'll want to use that, but if you do it'll save you a lot of time. The second is that the drive map gives you a visual indication of the number and position of any bad sectors. Macrorit Disk Scanner's major disadvantage is it's for reporting only. It can tell you about disk problems, but there's no option to try and fix or reallocate them. Whether it is the fact that you are getting power outages frequently or you recovered from a virus infection that lead to error-correction codes mismatches, there are several ways a hard disk can end up with bad sectors that do not respond to read and write request. 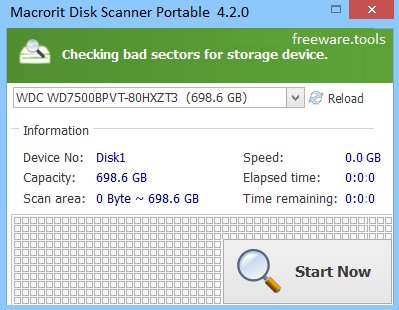 Macrorit Disk Scanner Portable is an application designed to help you scan your HDD for bad sectors and hence, help you prevent data corruption, data loss and even hard disk failure if your PC is rapidly developing such issues. The utility comes with a clean look and a user-friendly, so it is unlikely that you can encounter any issues. You can select the drive that you want to test for errors and wait for the tool to finish the analysis to determine if the issues are caused by bad sectors or you need to investigate further. It is worth mentioning that the application works with a plethora of local and external drives, including but not limited to iPods, Secure Digital cards, Micro cards, USB and Compact Flash drives, DE HDD, SATA, IDE, Hardware RAID, SCSI, FireWire, SSDs and Floppy drives. Generally speaking, the duration of the scan depends on the size of drive, so you are likely to diagnose a smartphone SD card faster than a local drive. Then again, you should know that the program comes with an option that enables you to scan only specific areas from the drives, providing you have a clue about the area that is responsible for errors and data loss. On the other hand, it is worth mentioning that the application does not include a function that allows you to fix or remedy the bad factors detected. Moreover, the tool is specialized in identifying bad sectors and does not help you find other possible HDD issues. In case you file transfers have become relatively slow, you are experiencing errors or have recovered from a power outage or virus infection and you want to make sure your hard disk is alright, then perhaps Macrorit Disk Scanner Portable could lend you a hand.